Jester kicks off 2007 with a new series of Q&A interviews with performers from the worlds of stand-up, sketch comedy and improvisation. The first interview here is with Michelle Buteau, a gifted and energetic comedian who is also making forays into television and YouTube-style short films, with a Comedy Central Premium Blend appearance already under her belt. Jester: Is your onstage persona an extension of yourself or would you say it’s completely different? 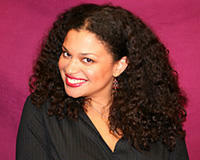 Michelle Buteau: It started out as me just being me but now I have a definite stage persona. It’s me but just bigger. It’s a bigger version of me. J: Comix’s Fresh Meat show has a Q&A with the comedians afterward. To steal one of their questions, what was the first joke you ever came up with, when you were a kid or in your first stand-up set? J: Did you get into comedy only as an outlet for that, not thinking about anything else? MB: It was nothing more than an outlet. I got into comedy because people told me I should, in talking to my co-workers or friends back home -- telling them about my New York experiences or how I had a roommate who was crazy, who had a white cat named Cocaine. They’d say this wasn’t serious, but I said ‘this is serious.’ I’d write really long e-mails about my day. People really liked them and would forward them in their office. J: It’s always said that it’s tough for women in stand-up comedy or comedy in general. J: Do you keep diaries or notebooks of jokes … a library of things like Orny Adams in “Comedian”? J: How do your ideas come to you? Out of life or your experiences? Or is it your observations? MB: It just really comes out of inspiration whether it’s observational humor or … sometimes, when I first started, in my first year, I would talk to my friends and be on a roll. When I get upset, the funny really comes out. Whatever my friends would laugh at I would remember and write down, but you can’t rely on that because that won’t happen all the time. So I force myself to write a lot even if it’s just a to-do list or things I’m thinking about. Then I just talk it out, whether with a friend, or on stage. Like James Brown just died -- I’ll think of two or three things that are funny, or ironic or interesting or even sad. I like to really work out bits when I’m hosting because you get more time to play with the audience, and they’re less judgmental if it’s not a joke or not funny. It’s just a process. Some things I will say and it works immediately. Other things you have to work it out and play with it. J: James Brown was scheduled to play a New Year’s Eve show at B.B. King’s, and the ad had already gone to press and appeared after he died. MB: That’s kind of cool though -- he was still playing up until [the end]. J: Who do you like in stand-up or sketch comedy and how have those people influenced you? MB: I’ve never been a comic’s comic. I never had Richard Pryor albums that I secretly listened to. I was just into music and sports. I’m just starting to get my comedy education. People compare me to this, that and the other. But people who really influenced me are my immediate family and friends … and my peers, people I work with who I really appreciate like Becky Donohue, Rachel Feinstein and Greg Giraldo. People I work with inspire me because I know what the struggle is like for them. I can relate to that and empathize with them. My peers really inspire me more than anything. If I have to go with someone famous, I love Louise Jefferson [played by Isabel Sanford], Leslie Nielsen, old school slapstick, facial expressions. But I’m also into the groundbreakers like Richard Pryor and Lenny Bruce. … I’m not into improv so much.